It’s time for Friday Fictioneers. I was delighted to see Lauren Moscato’s picture this week. She had shared this photo on Facebook many moons ago and instantly I thought it would make an excellent prompt for Friday Fictioneers. It took me a long time to bring it to Rochelle. I’m glad to see it here. Lauren always entertains at her blog, Tales of a Charm City Chick. Stop by her blog and she’ll make you feel right at home. Seeing the photo ahead of time doesn’t make writing a story any easier. I lost my father two weeks ago and feel as if I’m living in an alternate reality. This prompt seemed appropriate to capture this idea. I apologize if I am unable to comment on your stories this week. My computer is ill. I will do my best. I may just be reading on my phone. The frame of painted flowers looked wrong in the corner. “It’s yours now. The items remain the same. They’re only rearranged,” the man said as if reading instructions. Dishes in the cupboard reached higher and new books lined her shelves. “But that door is different,” Louise said, gazing out of a window at the tops of trees. “It can’t be used.” She looked around and realized she was alone, mumbling to herself as before. She bolted the door and hung the picture there. It was as good a place for it as any. Friday Fictioneers is a weekly writing group that attemtps to write a 100-word story in response to a photo prompt. A big thank you to Rochelle Wisoff-Fields for hosting us each week. Thank you! Thanks to Lauren for allowing me to share her photo. See this link for more stories from the Fictioneers. I felt a lot of sadness and change coming through in this story, but well written. Thanks, Ali. It is sad. Maybe next time I’ll have a happy one. Thanks for the kind words. I agree with Alicia. Those two sentences carry a lot of weight. I remember the strange emptiness that came over me after my Dad passed. Spending extra time outdoor in the days that followed was especially therapeutic for me. Writing is also a wonderful outlet. I’m glad you were up for it. May God Bless. Thanks, Russell. I wrote those two sentences down first. I made sure I wrote them down before I forgot and sure enough I needed to look at my notebook to remember them. 🙂 I have so many new items in my house of my dad’s that are surrounding me. They look foreign in my house and, of course, they won’t bring him back. I’m hoping to continue the writing. Thank you for your support. That line was the first thing that came into my mind that made sense. You see the items, but all you really want is the return of your loved one. The items can’t make up for the loss. Thanks so much, Alicia. I hope that writing will help you work through your grief, Amy. It’s been helpful with mine. It takes time to adjust to “the new normal” of loss and yours is still very fresh. 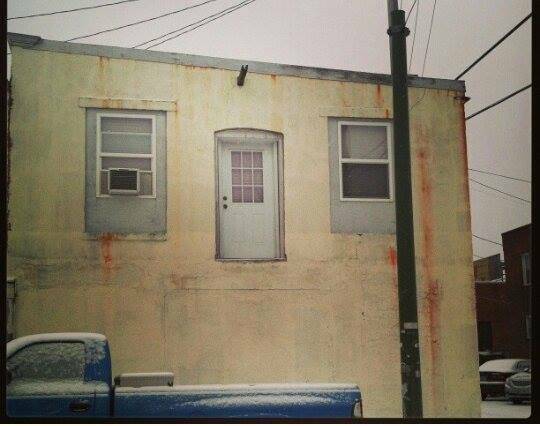 That door is indeed different. Well said! I do hope writing helps me. It can’t hurt, right? I’m glad to hear writing helped you. If feels pretty fresh, that’s for sure. I feel like I’m strong, then I fall apart. I know it’s to be expected. It has helped me live in the moment. I will say that. Thanks for your kinds words. It’s the first step that gets you. I’m so sorry for your loss, Amy. My deepest condolences. May God Bless you and gives you strength! Thank you, Mihran. I’m praying for strength. Nan, this is what I hear by many who have lost parents and loved ones. It’s nothing to get over. Your life will just be different. This idea that you must get through it doesn’t really apply here. Thanks for your support. Glad you liked my story. I too am sorry for your loss. I hope your wonderful memories will bring much comfort and healing. I loved your story. You’re welcome and I’m certain he is. Glad to see you were up to writing another story. And kudos to Lauren for getting her photo chosen. Thank you, Carrie. Writing has been helpful. It’s such an interesting photo, don’t you think? It’s just begging for a story. Thank you, Kelly. I definitely have more to share. Thanks for being here. You’re walking through another door now, Amy and it changes you forever. That’s not a bad thing, just another thing–in life, and you’ll learn how to move through it eventually, with less pain. I loved your story. Much said in very few words and beautifully-written. Be well! Another chapter in life, for sure, Brigitte. I expected to walk through this door at some point, just not now. It’s still a shock in some ways, although I moving through so many other emotions as well, just taking it as it comes. I’m glad you enjoyed my story. Thank you so much. i’m sorry for your loss. by the way, the act of bolting the door and hanging the picture there was a perfect ending to your story. Gosh, you’ve captured it all right here. This might be one of my favorite Friday Fictioneers, for all you say, and for all you left unsaid. Truly beautiful. Wishing you peace today and in the coming months. Ah, thanks Jen. That means a lot to me and for this to be your favorite. Thanks for the well wishes. I’m working on it. Taking it slow for now. Thanks for your support. This is a great story, a very imaginative use of the photo prompt and I believe incorporates some of your recent experience. Amy, I’m so sorry for the loss of your father. As adults, we think we are ready for anything, but we really are not. The loss of a parent at any age is still tragic. I read in another post that your father’s memorial service was laced with wonderful stories, tears and laughter. I think that’s a terrific comfort. One of the funniest and most affectionate stories I ever heard about my dad was at his wake. Even now, 23 years later, I smile when I think of it. God bless you, Amy. You’re in my prayers. Thick with meaning and dark with sadness, but lovely. So sorry for your loss, Amy. I do agree this prompt has been a fine one. Wonderful amazing responses. Thanks for the compliments and your lovely comments. I’m glad it had such meaning for you. Thanks for being here. She looked around and realized she was alone… there is so much emptiness in that moment. Beautifully crafted, Amy. I think there are those moments in grief where you kind of forget where you are. That’s what I was after. Thanks for the kind words, Melanie. I sense the sadness, so writing will help … but more importantly,time will take care of everything … especially if you give yourself and time a chance. Good so see you posting. I think writing will help me a lot. I just hope people won’t get too sad with all my sad writing. People tell me time will help, so I will take it as it comes for now. It’s brought me a lot closer to my siblings, I think. We don’t take anything for granted now. Thank you, Frank. Thanks for reading, as always. Happy to see you slowly resurface. Writing will work out those kinks. Keep the faith. Thank you, Mark. I hope so. I will write on. It certainly can’t hurt. Actually I do think it will help me a lot. Amy, thank you for sharing the picture and this story. I can’t imagine how difficult it was to write and how you must feel. You have been in my thoughts over the last couple of weeks. I’m glad you wrote, although I am sorry it was under these circumstances. Thanks for inspiring me and maybe even Renee! Beautifully written. I could feel the sadness. Good luck, Amy, I know how you feel. The world will “look wrong” for quite some time and may never look the same again. And it never will be quite the same again. You speak the truth. It never can be the same. It’s as close to an alternate reality as I’ve ever had. I’m trying to move forward with a more meaningful life. Hopefully, in some ways, I can make other things better. Thanks for all your support, Perry. I’m sorry for your loss Amy. Let time pass. Lovely story. Thank you, Sandra. Everyone tells me that time will help. I will have to believe that for now. Writing helps me get through the loss of my husband this past December. I truly hope it helps you. My deepest condolences to you. Your story is lovely. I’m glad to hear that, Dale. I’m truly sorry for your loss as well. I will keep writing. I think it will help and certainly my wonderful blogging friends are such a comfort. Thanks for being here. Thank you. It is amazing the amount of love I received from my blogging friends! They (we) will be there for you too! I am sorry for your loss. My prayers are with you and your family. Beautiful story, I’m sure inspired by your own sadness and loss. Thank you for sharing. Thanks so much Tiffany. Thanks for keeping me and my family in your prayers. I think it was helpful to write this story. Thanks for reading. Beautiful story, very apt title. I lost my father a few years ago and I have moved on, but it’s a strange thing that I almost didn’t want to. Thank you. I’m so sorry for your loss. I can say I know how it feels. I can also sense how not wanting to move on would be letting go of him. Somehow grieving allows you to hold on, even it’s in sadness. Indeed, I never knew it would affect me so deeply. I’ve never quite felt this sad before. I appreciate your support. Amy, you’ve been in my thoughts. I know how surreal things can be after the loss of someone we love… good for you to write, as you work through your grief. It’s so therapeutic. Thank you, Millie. Thanks for the kind praise. I’m glad it held meaning for you. Hopefully, with time, things will get easier. Grief is so personal and such hard work. I can’t say anything that will make it easier. You’ve said a lot. I’ll just take it as it comes. I miss him. I’m talking a lot to my sisters which helps a lot. Thanks so much, Tracey. Amy, I can feel the cold unfamiliarity of the new situation in this story so clearly, the new things in unfamiliar locations. I didn’t put together when I saw the name with the picture that this Lauren was La La of Charm City Chick fame. I’m glad you brought it over here. Yes,, it’s La La! I’m glad you enjoyed it. Thanks for your nice comments. Happy Easter to you, too, David. Again, thanks for sharing Lauren’s photo. As you can read in my story, the losses still hurt years down the road. My mom died in 1981 and my dad in 1984. Can it really be thirty years plus? My brother and I still laugh when we tell stories about our parents to each other. Your story is poignant and well written. I hope it was cathartic for you. I’m sure your dad is beaming with pride from heaven at the lovely daughter he raised. You’re so kind. Oh, I hope he’s beaming. I’m so glad I wrote. It always feels better when I write. It’s difficult to think this is the new normal for me. I still process it every morning. This is the price of loving someone, I suppose. It’s tough being human, isn’t it? I hope to cling to memories soon. It’s great you can share those with your brother. Life is about creating those memories, so I should look forward to those. Thanks for choosing the photo, too. All those you love live on in your heart. They are there for you all the time. It’s not a good solution, but it’s a true one. I still talk to my parents and keep them close, even though they left this world long ago. A wonderful story, sad and rightly so, and reflective. Thank you for this. It’s exactly what I needed to read right now. How did you know? I’d like think my dad isn’t gone, but that he’s just somewhere else and someday I’ll see him again. Until then, I will heed your words of truth. Thanks so much. Such a moving story – so sad. Condolences on your loss – it’s a hard and disorienting time when we lose a parent. Thank you, Margaret. Yep, it’s a hard and disorienting is a good way to describe it. Thank you, Suzanne. I’m glad the prompt inspired. Thanks!